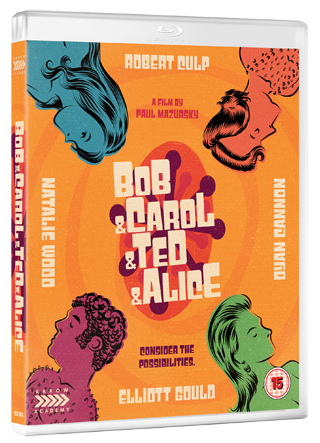 Bob and Carol and Ted and Alice – Film Review. 60s timepiece on Bluray. When it was released in 1969, Paul Mazursky’s satire captured the zeitgeist. It was also a little risqué, dabbling as it does in the mores of married life. But now, almost 50 years on, it hasn’t really stood the test of time. It’s entertaining enough, but has become something of a curiosity piece rather than a compelling slice of social history. Natalie Wood is the movie’s big star name. Back in ’69 she was at the height of her powers, had already had three Oscar nominations and was rarely out of the headlines thanks to her private life, having had a brief relationship with Elvis Presley and been married and divorced from Robert Wagner (they would famously remarry in 1972 and remain together until her death in 1981). She delivers a characteristically professional performance here, playing Carol, the wife of documentary-maker Bob. He’s played by Robert Culp, who at the time was best known for appearing in TV show I Spy alongside Bill Cosby, who has a blink-and-you’ll-miss-it role in a crowd scene. Bob and Carol’s weekend at a proto-hippie retreat sparks the whole story. It’s meant to be research for Bob’s next project, but the couple ‘find themselves’ while there, deciding to be more open and honest about their feelings, and accepting of others’ foibles, including Bob’s extra marital affair. It may sound as if the film pushes boundaries, but it’s actually now a little twee. In one of the special features on the disc, director and co-writer Mazursky claims the film could be made now with no alterations, but I doubt that’s true – what would be the point? We’re probably all a bit too cynical to believe in the course taken by Bob and Carol for a start. Joining Wood and Culp on screen are Elliott Gould and Dyan Cannon as Ted and Alice. Cannon seems a little too worldly to play the supposedly prudish Alice, even in the scenes where she finally lets go of her reserve. Gould, however, is the film’s standout performer, a real delight whenever he’s on screen. If you’re a fan of late-1960s, early 1970s cinema and have never seen it, you’ll probably enjoy the tale. Just don’t expect anything particularly groundbreaking or cutting edge.